Ornamental grasses – if I had to choose a favorite group of plants in my garden, they would be at the top of my list. Few plants are as versatile, carefree and dynamic as grasses. And yes, they do flower in subtle ways that grasses do – and they make wonderful companion plants for flowering perennials, especially those that bloom in mid- to late summer. Grasses contribute a contemporary design edge that will jazz up almost any garden. They really deliver on low maintenance and high style. Perhaps the biggest misconception about grasses is that they are all invasive and will take over your garden. In fact, most grasses sold for home garden and landscape purposes are well-behaved clumping types that won’t misbehave. Grasses are magical because they’re never static. They emerge lush green early in the season, and by summer they’ve filled out and begin to plume or flower. Through the season, they move with the slightest breeze and sound wonderful when the wind rustles through them. In the fall, you get the later warm season grasses pluming and then changes of color to wheat, gold, flaming orange or copper. Grasses are gorgeous throughout the fall, and their wheaten-colored foliage looks attractive all winter. No other plants are as easy to maintain. All you need to do is cut down and clear away the previous year’s growth in late winter or early spring. Among the popularizers of grasses are Wolfgang Oehme and James van Sweden, of the Baltimore-based landscape architecture firm, Oehme van Sweden, who pioneered a garden style that uses grasses en masse along with perennials. Van Sweden’s book, Gardening with Nature, is an excellent guide to this naturalistic style of gardening. 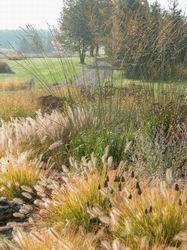 Meanwhile, in Europe, Dutch plantsman Piet Oudolf, author of Planting the Natural Garden, was working in a similar theme; planting grasses and perennials in meadow-like swaths. This naturalistic style is better suited to the climate and conditions of many parts of North America than the more labor-intensive English perennial border. More information: How to plant and care for ornamental grasses.